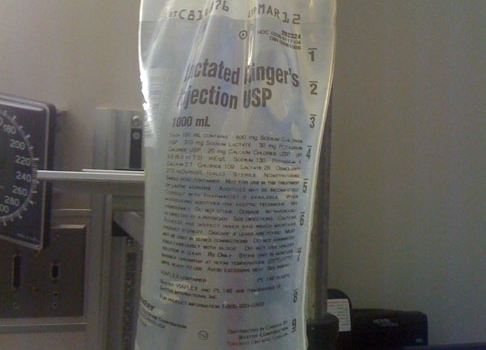 Saline has been the go-to intravenous solution for decades. 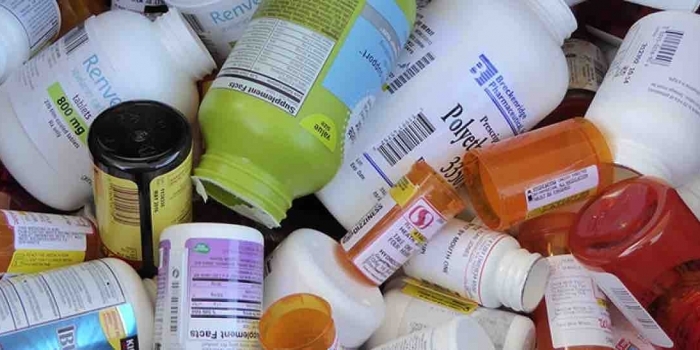 Every year in the United States, more than 200 million liters of saline are given to patients. 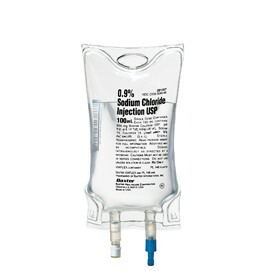 Two studies presented at this week’s American College of Chest Physicians meeting indicate that we may have it all wrong and that we should NOT be using saline for most patients. Saline is an isotonic crystalloid solution meaning that it has the same osmotic pressure as blood. For years, we thought that isotonicity was all that was important and that the specific electrolyte constituents did not really matter. Now, it looks like it does matter. 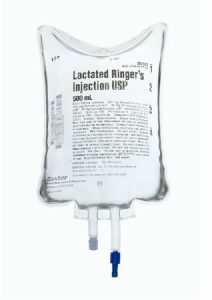 There are 3 commonly used isotonic IV crystalloid solutions: saline, lactated Ringer’s, and Plasmalyte. They have significantly different compositions as can be seen in this table. Of particular note, the concentration of chloride in saline is about 50% higher than the concentration of chloride in blood. This has raised questions about whether this chloride can be harmful by creating a hyperchloremic metabolic acidosis or by other adverse effects of excessive chloride. In the SMART study, 15,802 patients admitted to the ICU were randomized to receive either saline or a balanced IV solution as their maintenance and resuscitation solution. 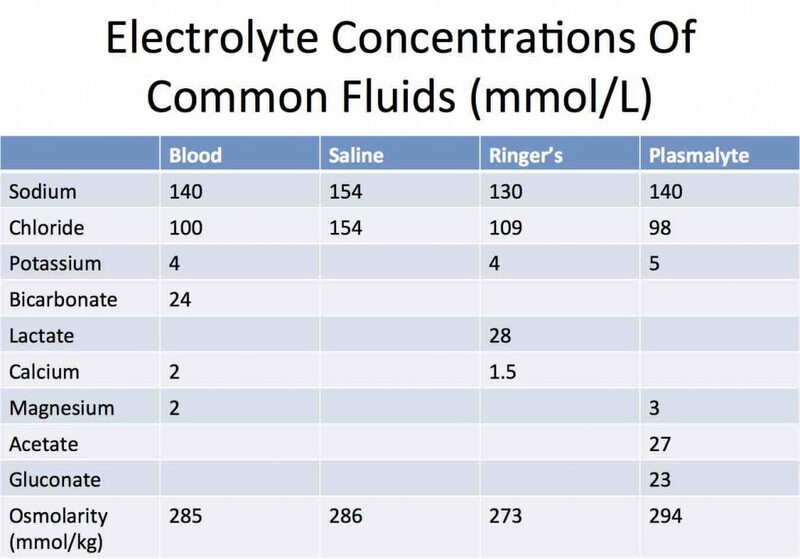 The balanced solution was either Ringer’s or Plasmalyte, at the clinicians preference (Ringer’s was used 90% of the time and Plasmalyte was used 10% of the time). 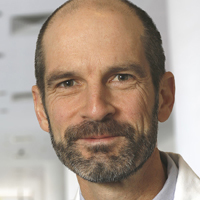 The results showed that patients receiving saline had a 15.4% incidence of a composite outcome of death or adverse renal events compared to 14.3% in patients receiving a balanced solution. This translates to a 1.1% increase in the composite score of death, need for dialysis, or persistent renal dysfunction. Patients who were septic had the greatest adverse outcome difference with saline compared to a balanced solution. In the SALT-ED study, 13,347 patients admitted to a non-ICU nursing unit were randomized to receive either saline or a balanced IV solution. The main outcome was the “MAKE30” which was a composite score of hospital-free days and adverse kidney events. Once again, the patients receiving saline did worse with a 5.6% MAKE30 versus 4.7% for the patients receiving a balanced IV solution. The overall hospital length of stay was the same. Patients receiving saline had a significantly higher blood chloride level and lower blood bicarbonate level during their hospitalization. These are pretty compelling studies and they build on other recent studies that have indicated that patients receiving saline have a worse outcome than those receiving balanced crystalloid solutions. But what about colloid solutions? One of the most common colloid solutions in use is hetastarch, but in a trial comparing hetastarch to crystalloid solutions in resuscitation of patients with sepsis, hetastarch also was associated with an increase in renal disease and an increase in death. A second study of hetastarch compared to crystalloid in 7,000 patients in an intensive care unit with multiple diseases (not just sepsis) also showed an increase in adverse renal events with hetastarch compared to crystalloid. At this time, we still don’t know what the ideal intravenous fluid is for resuscitation and fluid maintenance. For example, there are no head-to-head comparison studies of lactated Ringer’s solution to Plasmalyte. Furthermore, there are any number of other crystalloid solutions that could be created using biologic electrolytes that have not yet been used in medicine and it is likely that one of these could be superior to any of our existing crystalloid solutions. 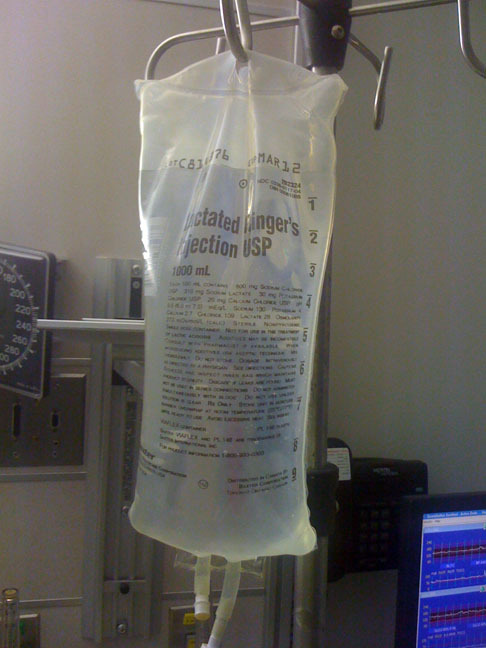 The recent Baxter saline bag shortage gives us an opportunity to begin to move away from saline to balanced crystalloid solutions. 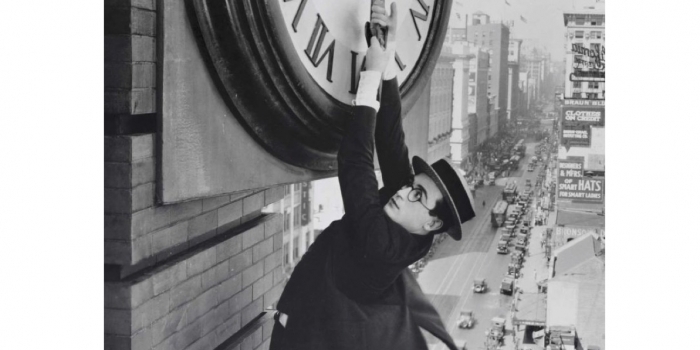 But the use of saline is so ingrained in medicine that change will not come easily or quickly. However, it is now time for us as hospital leaders to promote the use of lactated Ringer’s and Plasmalyte instead of saline.